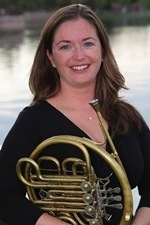 Dr. Rose French (B.S., Music Education; B.M. Music Technology, 2002) is currently a member of the Mill Ave Chamber Players, which is entering its tenth season this fall and was nominated for the Arizona Governor's Arts Awards, the City of Phoenix Mayor's Arts Awards, and recognized by Chamber Music America for their work in building long-term relationships in their community. They currently hold approximately 50 concerts throughout the season and curate 5 chamber music series in the greater Phoenix area. Their residencies range from educational outreach at charter schools to a Wednesday morning series in Sun City, Arizona. They also have residencies with the Phoenix Public Library and the Glendale Public Library, where they are the five-time recipient of the Glendale Performing Arts Partnership Grant. In 2016, the Mill Ave Chamber Players released its second album, "What the Birds Said" the Music of John Steinmetz, and in 2018 will record its third album, a culmination of four commissioned works for its tenth anniversary.